Written by USD Student Wellness | Monday, April 9th, 2018 at 9:54 am. 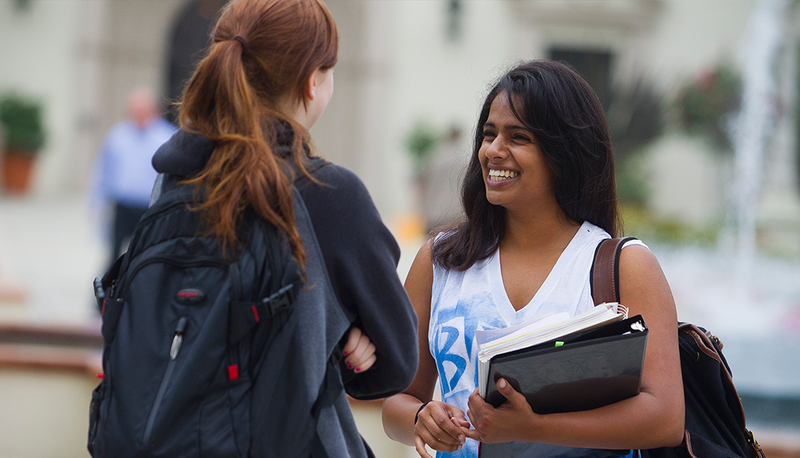 USD is committed to giving students resources that promote growth, learning, and the health and well-being necessary to strive for excellence. For this blog, I wanted to help highlight some of the helpful resources on campus that many students may be unaware of. While exploring some of the student resources on campus, I was astonished by how many I had never used or had little knowledge of before. 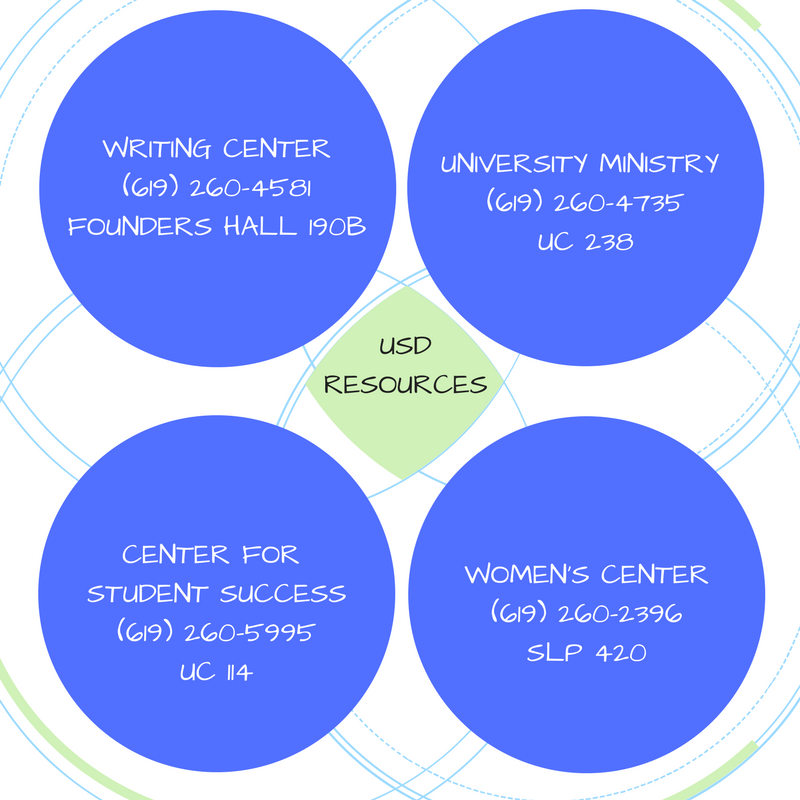 Here is a list of four of the services I learned more about that can help make your time at USD even more successful by building your USD network of support! The Writing Center is one of USD’s amazing tutoring services dedicated to helping students reach their academic goals. Providing services for students at any stage of the writing process, Writing Center staff can aid in the essay process and your overall success. At the heart of the Writing Center is the goal to engage in discussion, collaboration, and meaningful one-on-one exchange of ideas so that students learn to gain confidence in their writing abilities while improving their skills through process-oriented revision of essays. (619) 260-4581. The Writing Center is located in Founders Hall 190B for those of you who wish to speak to a consultant in person. University Ministry is a resource that engages with students to help them explore their spirituality and aid in its cultivation. Offering a number of faith-based programs and retreats for students seeking to enrich their spirituality, University Ministry hopes to engage and collaborate with students to help them address and respond to the emerging needs of our campus community. No matter a student’s spirituality, the University Ministry is here to offer support and engage in meaningful conversations that nurture personal development and encourage intellectual, social, and spiritual growth. To contact University Ministry, you can visit their website or call (619) 260-4735. A list of activities and programs can also be found here for those interested in becoming involved in service opportunities offered through the University Ministry. Their main office is located in UC 238 for those interested in visiting and learning more about all they have to offer in person. The USD Women’s Center creates an inclusive space for students explore their voice, identity, and sense of power. Offering a safe space for all members of the USD community, the Women’s Center invites students, faculty, and staff to engage in discussions around issues of oppression and inequality. Additionally, the Women’s Center does a great job at providing opportunities for students to learn more about pressing issues and what it looks like to transform this knowledge into action for positive social change. If you would like to contact the Women’s Center or learn more about what they have to offer, you can visit their website, call (619) 260-2396, or visit the center in SLP 420. You are always welcome! The Center for Student Success offers programs, services, and experiences designed to promote student excellence both in and out of the classroom. Known for their involvement in the First and Second Year Experience programs, the Center for Student Success also offers resources for academic coaching and unique online resource for students to track their college experience, titled the “Student Learning and Development Transcript”. “The CSS offers Student Success Coaching where professional staff and peer coaches are available to meet with any undergraduate student experiencing challenges at USD that impact academic performance and persistence” says Taylor Avery, Program Assistant for the Center for Student Success. (619) 260-5995. You can also visit their office, located in UC 114, to learn more about their resources. These four centers are just a small example of the many amazing opportunities for student involvement and supportive resources available on campus. The Writing Center, University Ministry, the Women’s Center, and the Center for Student Success are all equally wonderful places for you to build your network of support and create meaningful connections. The next time you’re in need of some help or wanting to get involved in a new community, remember that there are so great resources to explore on our campus!